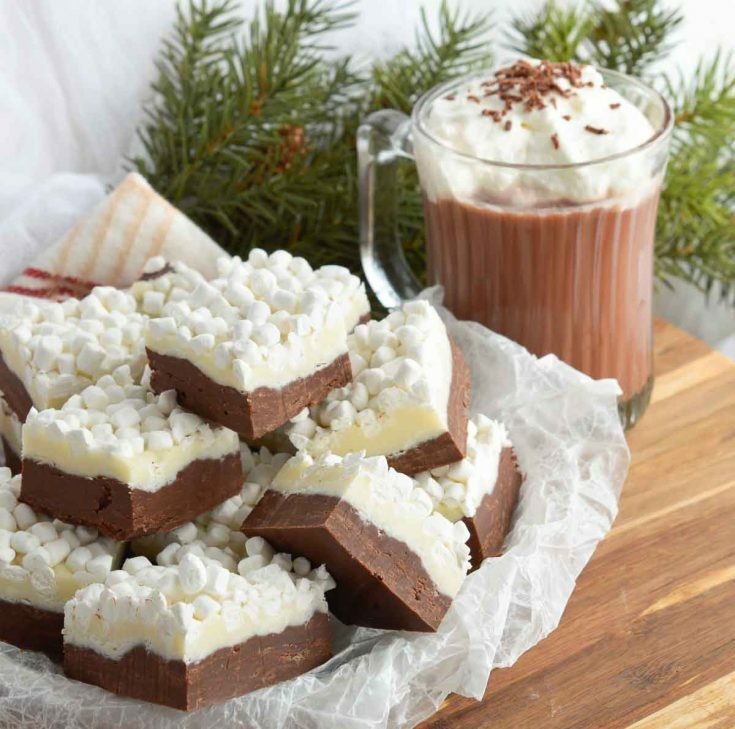 This Hot Chocolate Fudge Recipe brings two of your favorite winter desserts together. Hot cocoa and rich fudge topped with marshmallows! The perfect holiday party recipe. This is a sponsored post written by me on behalf of International Delight. Is there anything more comforting than a mug of hot chocolate on a cold winter day? How about a glass of thick, rich eggnog while sitting next to a crackling fire? Guess what, it finally dipped below 70 degrees here in Northern California. Yippee! You know what that means. . . I can actually enjoy all of the winter activities and traditions. Like hot chocolate and eggnog. I just love a mug of hot chocolate on a cold day, especially after months of 100+ degree weather! I don’t always know when the craving is going to hit me. Luckily International Delight now has Hot Chocolate and Nog. For hot chocolate, just heat and serve. And the Nog has been a great addition to my morning coffee! 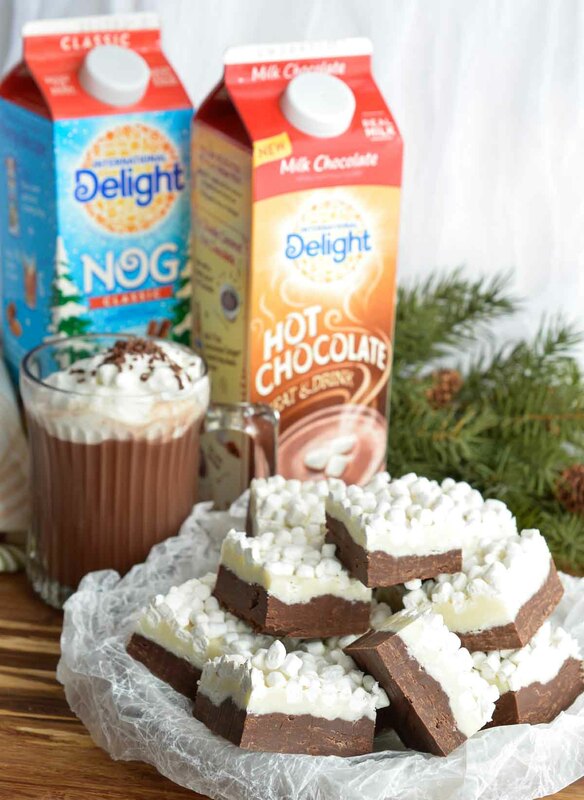 Get into the holiday spirit with International Delight Hot Chocolate and Nog! Visit InternationalDelight.com to share how ID helps you capture the spirit of the season for a chance to win a holiday brunch for friends and family hosted by International Delight! So what should you serve with a warm mug of International Delight Hot Chocolate? Hot Chocolate Fudge, of course! And I’ve got you covered because this Hot Chocolate Fudge Recipe is super quick and easy. It takes just a few simple ingredients and is made in the microwave. It is perfect for parties and edible holiday gifts. 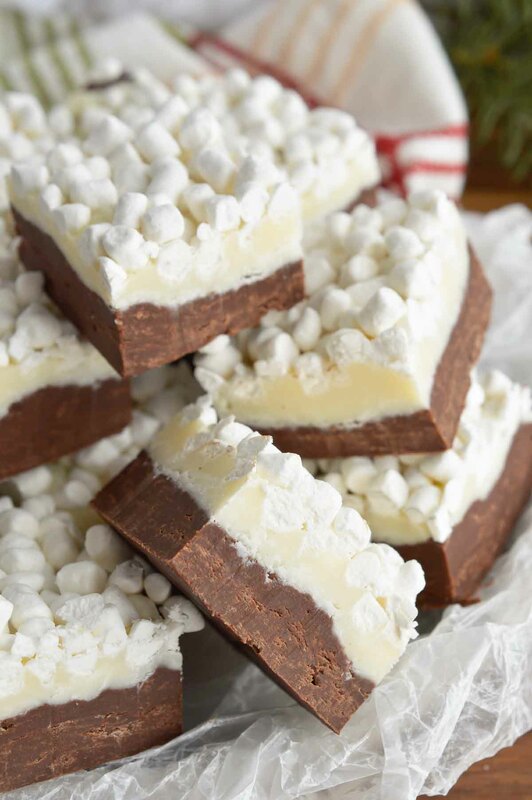 This fudge gets a lot of ooooohs and aaaaahs. Not just because it tastes awesome but everybody loves that it looks like a mug of hot chocolate in fudge form. Bring on winter. Bring on the holidays. Bring on jingling bells. Bring on snow. And bring on hot chocolate mustaches on smiling faces. In a microwave safe bowl; combine white chocolate chips with 5 Tablespoons sweetened condensed milk. In a separate bowl; combine dark chocolate chips with remaining sweetened condensed milk. Line a square 9x9 pan (or 8x8) with foil and generously grease with butter or shortening. Microwave dark chocolate 30 seconds, stir. Microwave 15 seconds then stir vigorously until chocolate is smooth. Transfer mixture into prepared pan and spread into an even layer. Top with mini marshmallows then gently press down. Refrigerate at least 6 hours to set. Remove fudge and foil from pan. Carefully peel all foil from fudge. 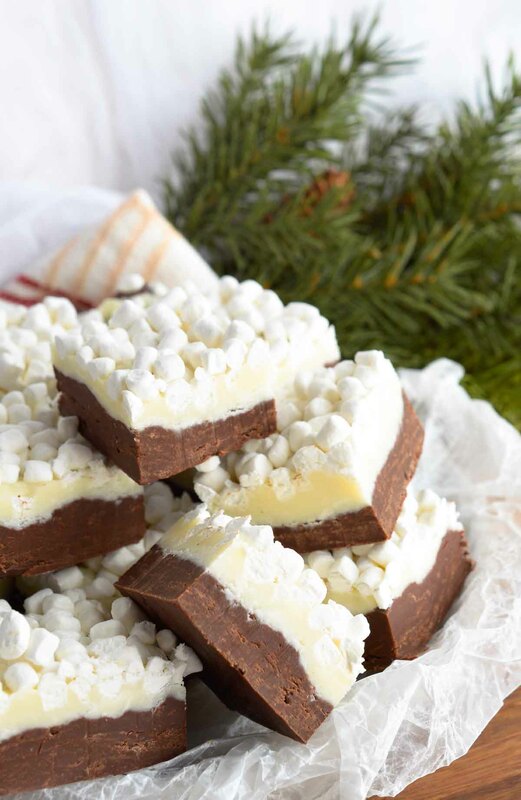 Cut fudge into bite sized pieces and serve. Did you take some time off or did I miss some of your blogs for some reason? Nope. I’ve been here doing my thing 😀 Glad you are back! What a great idea! And it’s so cute too. Love the ID Nog!! Thanks Dorothy! The ID Nog is delicious! It’s a great recipe! Can you freeze it and how long does it last? Also is there a substitute for the condensed milk? Any ideas on how long these would stay fresh sealed air tight and put in the frig? I eat my batches of fudge for about a week. After that they tend to get stale. I always eat my fudge within a week at most. After that it tends to get stale tasting. Can you find those mini marshmallows anywhere or do I need to try a certain p;lace? Hi Jackie! Yes, you can find these at most grocery stores in the marshmallow or hot cocoa section. Enjoy! Could I mix this fudge into a mug of hot milk and expect a hot chocolate drink? Or would that not work? It’s probably to dense to melt in milk. Gosh, I don’t know. I have never tried that. I totally should have! Let me know if you give it a try. I am wondering if you could substitute peanut butter chips for the white chocolate? Most of the white chocolate chips I have tried taste really “off”. The brand I recommend (& so does America’s test kitchen) is Guittard brand Choc-au-Lait chips. They have a lovely creamy vanilla flavor & no odd chemical notes. I will be using it to try out your recipe which sounds wonderful! Thanks! The recipe looks great! I dont have a microwave..could I melt everything au bain marie and for how long? Yes, the double boiler method should work fine. I can’t say for how long because I do not use that method. Enjoy! Hi, could I use milk chocolate instead of dark, I have some in the fridge to use up. Or does it need dark to take away the richness of the white? I cover it with plastic wrap to keep it from drying out. You can leave it on your counter or in the refrigerator. If you do refrigerate it just take it out 1-2 hours before the party to soften. Enjoy! Looking forward to trying this! Has anyone tried using parchment paper instead of foil? I’m wondering if it would be easier to peel off. Probably going to taste good but there’s no way that was enough white choc mix to cover the dark layer! I lost an inch all the way around the pan! Thanks so much for this yummy recipe! I made it for Christmas and it was a big hit with the family. I made it using milk chocolate instead of dark chocolate chips (as mentioned in the comments), since my family doesn’t care for dark and it came out great. For the pan I used my silicon square pan so no prep was required, I just poured the chocolate directly in it, put it in the fridge and peeled the pan away once it cooled. If you haven’t used silicon pans before I highly recommend them for fudge and butterscotch, (but I still like metal pans for oven cake/bread baking). You are going to have someone set their home on fire with this recipe. Foil should NEVER be used in a microwave. How long does this take to make? It takes about 10 minutes to make. But, it needs to set in the refrigerator for 6 hours. You could probably get away with 4 hours in a pinch.